We’ve all been on coffee dates. But can you recall a date where you have tasted 7 different kinds of coffee and 5 different kinds of tea? Now I can. 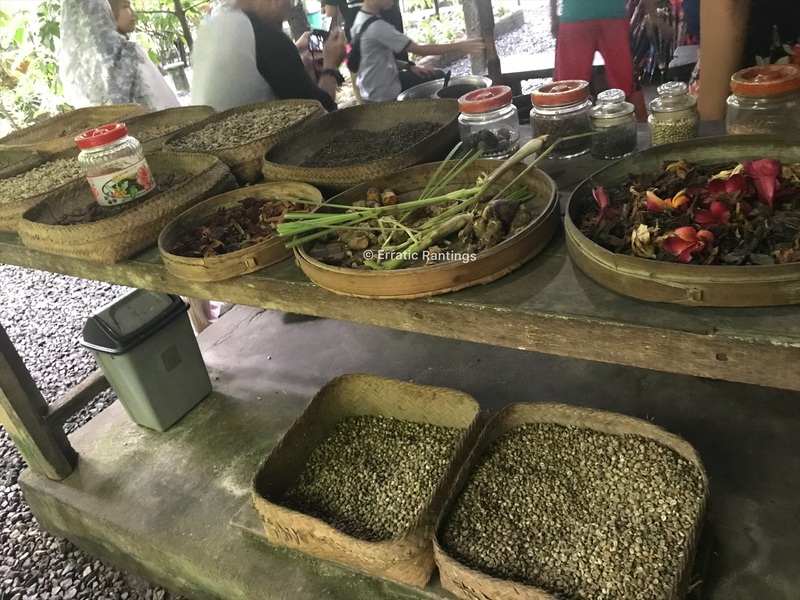 Welcome to Cantik Agriculture Luwak Coffee – where, of the many popular Bali gems, you get to taste Luwak, Salak and Arak. 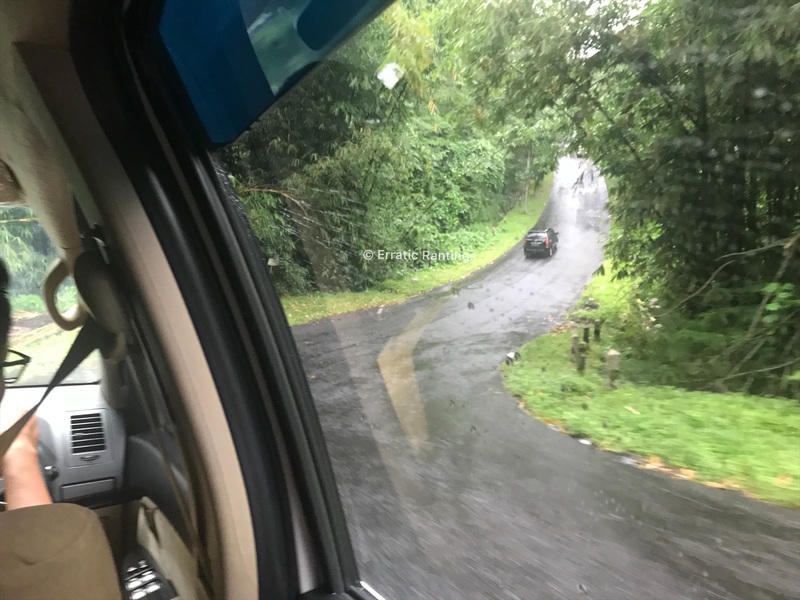 It was on Day 3 of our Bali trip that our white Fortuner pulled up in front of Cantik plantation. Kadek, our young and energetic guide for the day, informed us with a laugh that ‘Cantik’ means ‘cute’. He introduced us to our Cantik guide, a smiling girl with chubby cheeks. I couldn’t quite pronounce her name. She was happy to have us on the farm and took us around. Cantik is situated on the side of a valley. 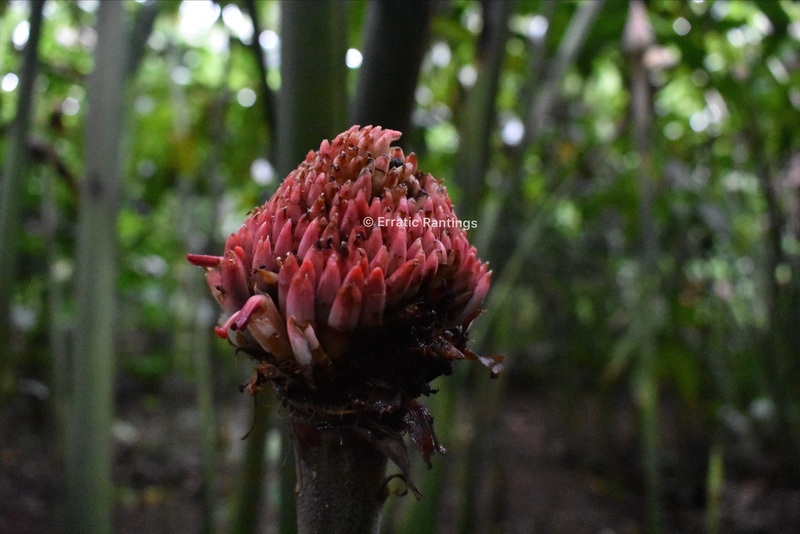 The farm is like a maze with a whole variety of plants growing there – Bali coffee, cocoa, mangosteen, rosella, ginger, ginseng, turmeric etc. 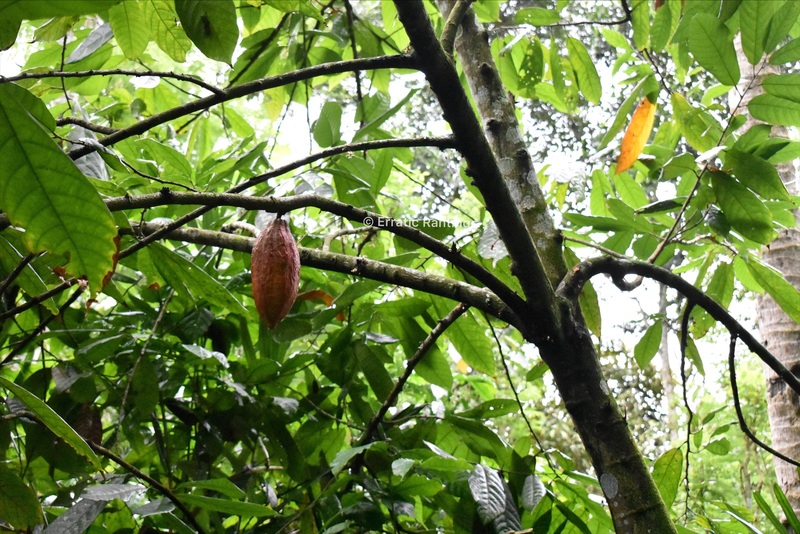 The cocoa plants have differently coloured fruit pods revealing the stages of ripening. Yellow- ripe, green – you gotta be patient. The mangosteen fruit upholds the name of the plantation. It’s like a ‘cute’ miniature of a green coconut. Tastes out of the world when made into tea! Little fruit’s got some kick. 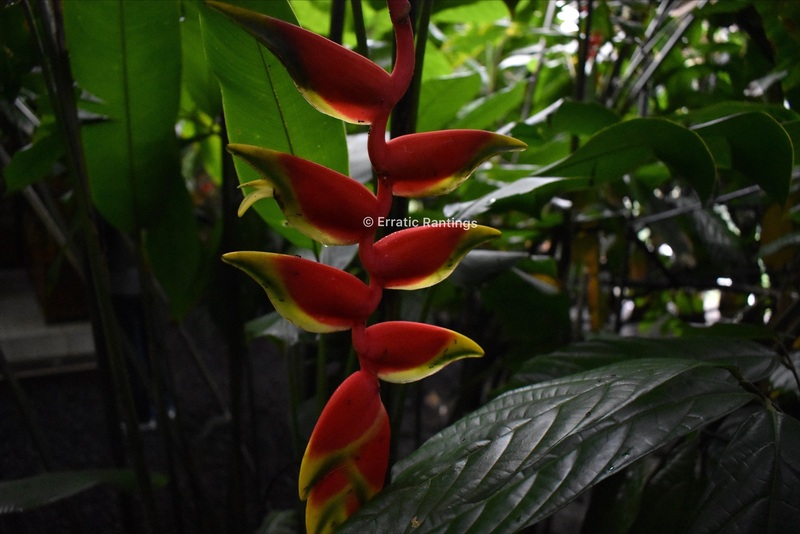 Rosella is a species of hibiscus – a bright red flower used to make tea. Of the few animals present in the plantation, the showstopper is the Asian palm civet. 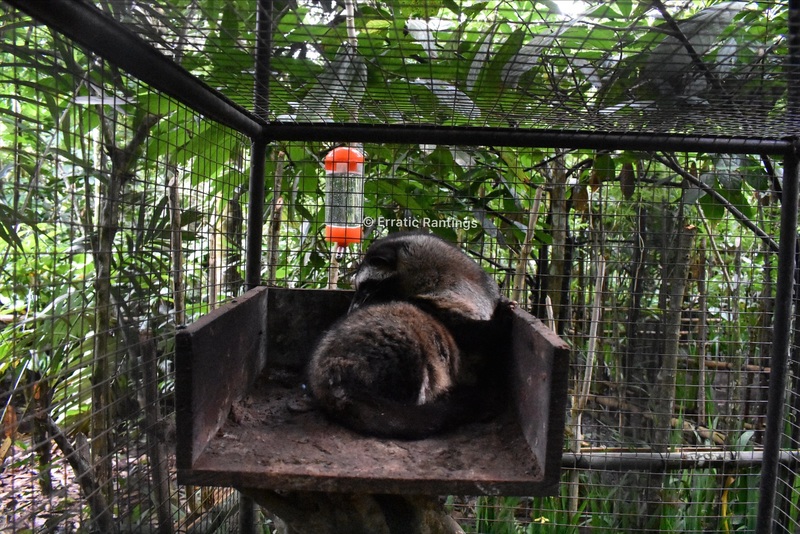 This civet is the animal behind the most expensive coffee in the world – Luwak. 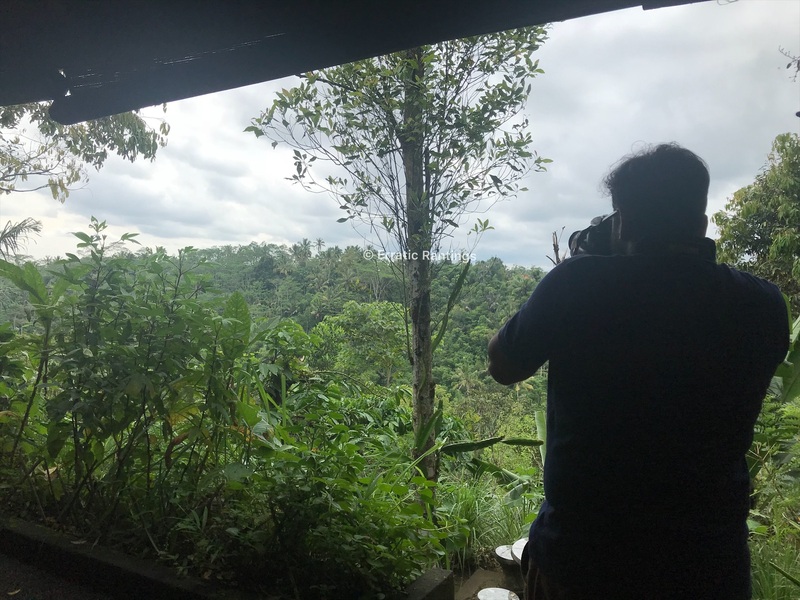 Our guide showed us how the Luwak coffee is made. The uniqueness of this process has turned it into a worldwide sensation. 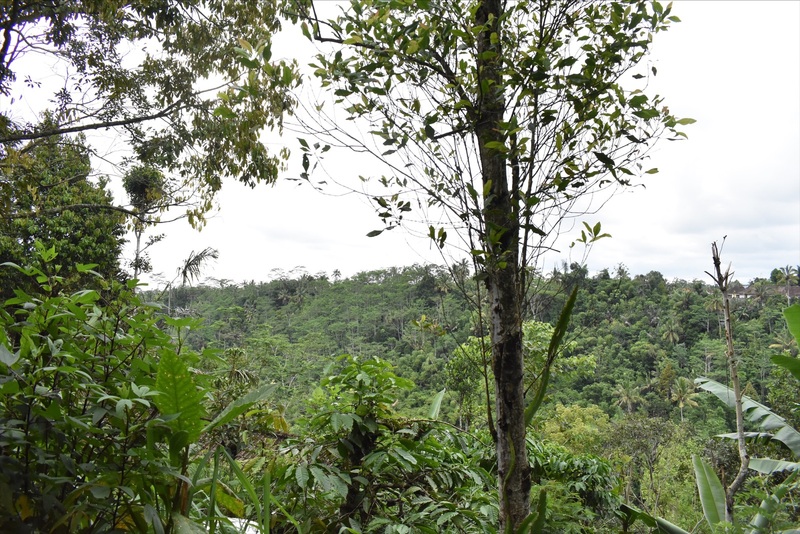 The civet feeds on only the uniformly-ripened coffee cherries grown in this plantation and defecates the coffee beans without digesting them. 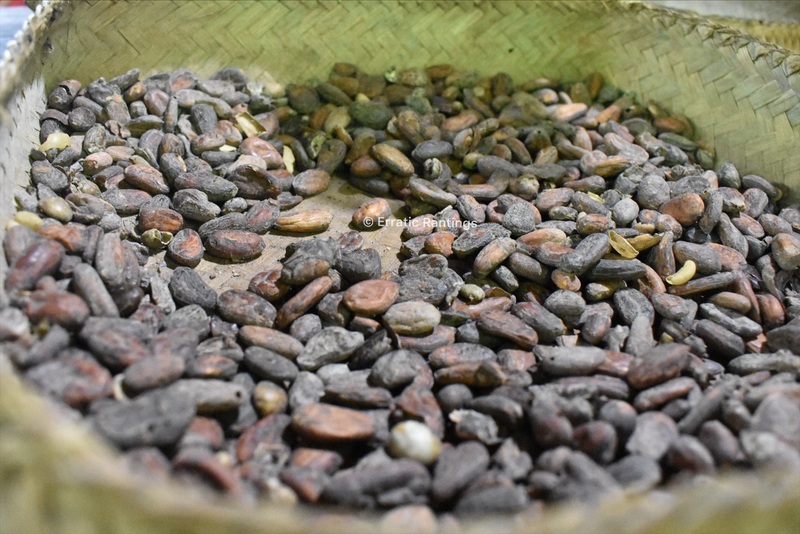 The beans are then collected from the poo truffles, washed and cleaned thoroughly, de-shelled, cleaned again and then dried. These are then roasted and ground manually with a mortar and pestle. And voila! 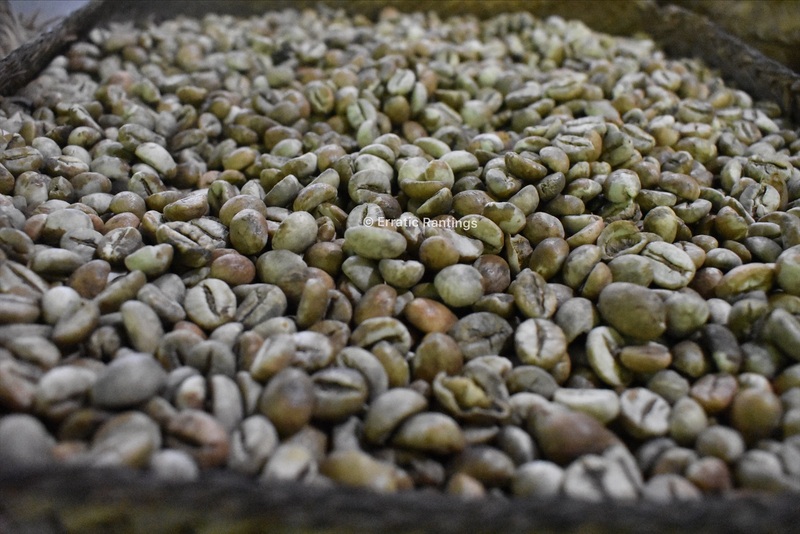 Out comes the most revered coffee powder in the world – Luwak! Dried coffee beans, flowers etc. 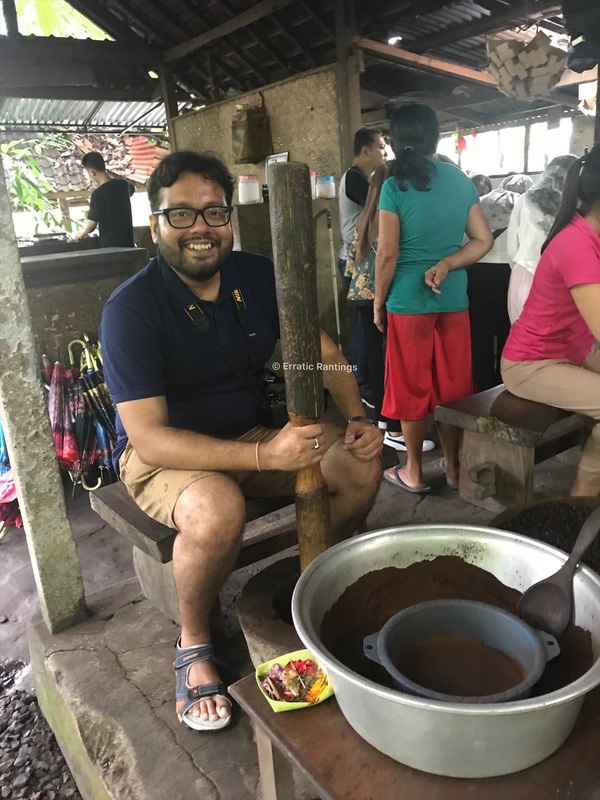 The above picture is proof that my husband has toiled with his own two hands (quite literally) to help produce the most expensive coffee in the world! Ha! 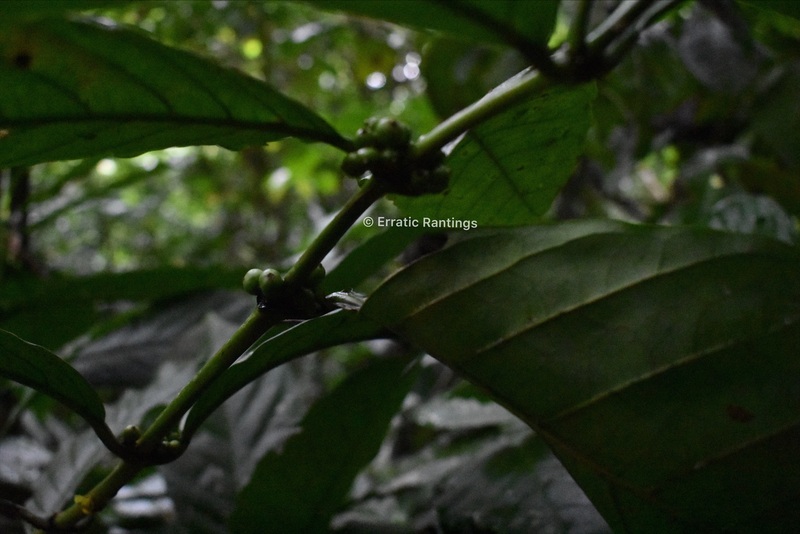 Our guide taught us to differentiate between Bali male and female coffee beans. The female bean is flat on one side but the male bean is fuller and almost round in shape. The male coffee bean tastes better than the female bean, making it more expensive. By now we were being led to the coffee and tea tasting area. 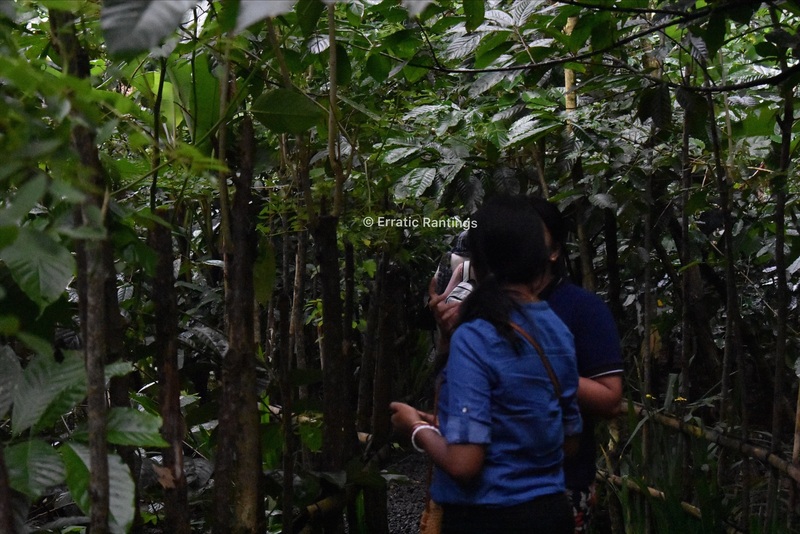 It was ripe with a rain-glazed scenic beauty. Couldn’t help falling in love with this place for a whole bunch of reasons. The smiling girl brought us a tray with 12 delicious-smelling cups of coffee and tea. We also bought a cup of Luwak coffee (known by the locals as Kopi Luwak) separately for 50,000 IDR. 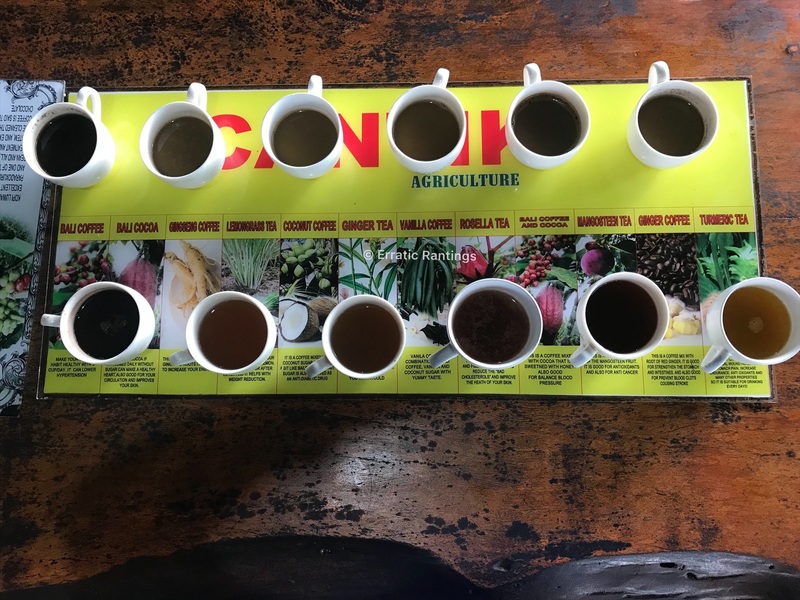 Of the 13 cups of coffee and tea I tasted, six stole my heart – Bali cocoa, lemongrass tea, coconut coffee, vanilla coffee, rosella tea and mangosteen tea. The lemongrass tea is especially refreshing. The mangosteen is a little acidic, the powder is pink in colour! The vanilla coffee is above and beyond anything else in this world. Our guide and I high–fived on vanilla coffee. She likes it the best too! I’m more of a tea person than coffee and Tathagata is the opposite. After tasting the Luwak coffee, Bali coffee and Bali cocoa, Tathagata looked like he had attained Nirvana. I instantly knew which samples to take home. We still cannot get over their tastes. 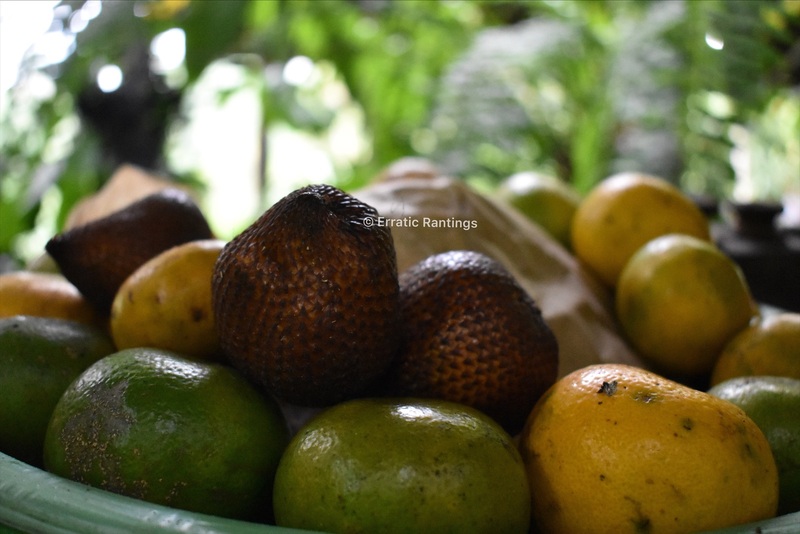 While strolling through the plantation, a basket with an interesting assortment of fruits caught our eyes. Our guide encouraged us to help ourselves to some. We selected the one with a snake-like shell. It’s called Salak or snake-fruit due to the scaly shell. The white flesh has a little acidic taste. It’s sweet, it’s sour and incredibly juicy – a Balinese favourite. On our way out, we stopped at the shop selling coffee, tea, sugar and other souvenirs within the plantation premises. We knew what we wanted to buy. If you are here, I would suggest you to buy their coconut sugar apart from the tea/coffee you select. This sugar has a unique caramel-y flavour which enhances the taste of the coffee. This shop was also selling one of the popular spirits of Bali, arak. It is made from coconut palm flower. We’ve heard that arak is a dangerous liquor. If the proportions are not right, it can lead to blindness and even poisoning. So, if you’re in Bali, I would suggest you stay off it. 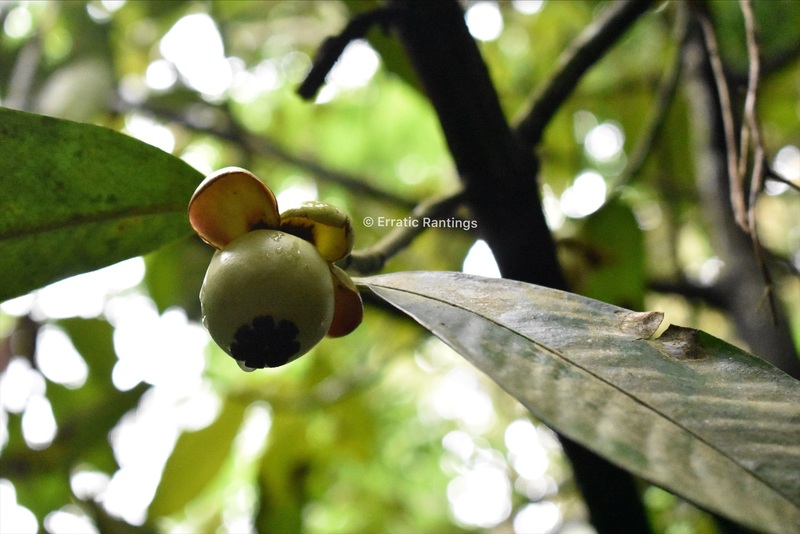 Cantik Agriculture Luwak Coffee is an experience you shouldn’t miss if you visit Bali. 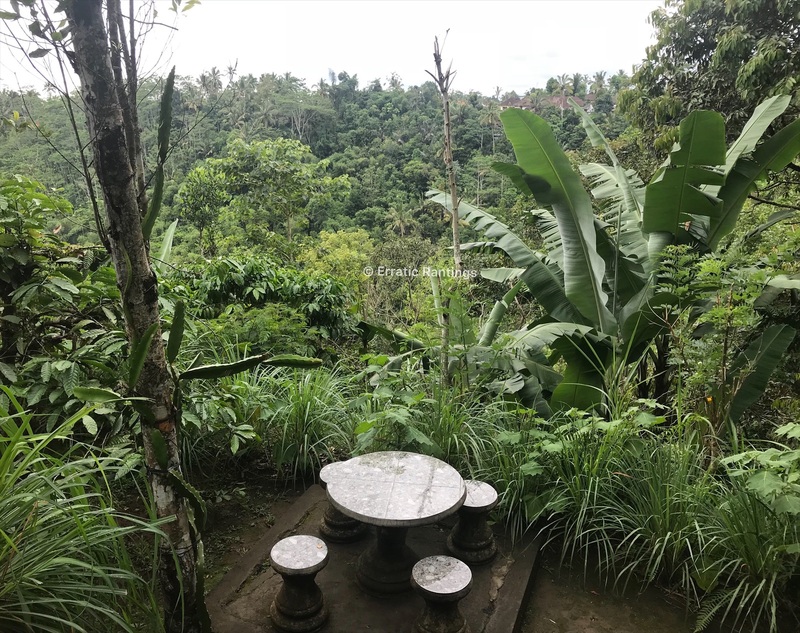 It’s in the Gianyar area and is a 1.5 hour drive from Kuta. Yes, it’s a little far and yes, the samples are a little expensive – but it will be a coffee date you will remember for the rest of your life. Isn’t that what we live for? Memorable experiences and piping hot coffee? This sounds like an amazing tour! So cool to learn about all this and taste test everything! Um, now that you told me about that coffee that comes from an animal that poo’s it out…not sure I want to try that one! Hahahaha I had no idea about this, but so interesting! Hey Heather! I know how the process of Luwak sounds. It may be a little off-putting but if you’re a coffee lover, you’ll love it. It’s extremely strong and would have you running around all day! This coffee lover is a little jealous of your experience. It sounds awesome. I’ve heard so much about luwak and would love the opportunity to sample it. Many of the other coffees and teas sound interesting too. Hey Ava! 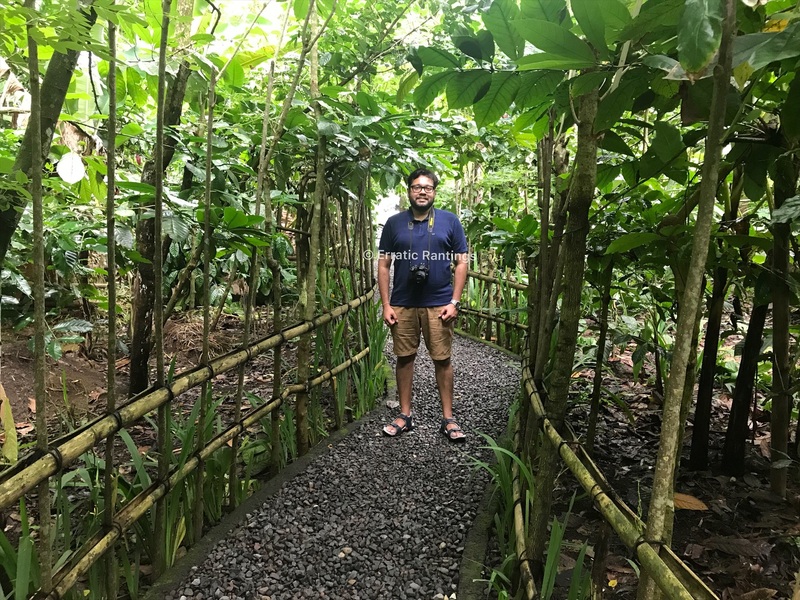 It was an excellent experience and you should definitely plan a trip to Bali. Trust me, the most expensive coffee in the world is worth all the traveling. I’m sure you’ll love it. Wow, second highest consumer of coffee? I didn’t know that. 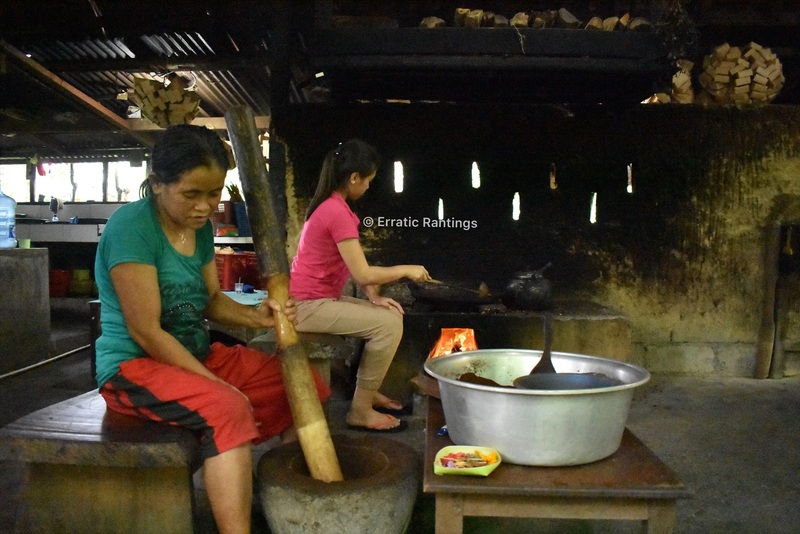 Yes, the process of making Luwak coffee is really unique. The coffee is quite strong – you’ll either like it or you won’t. Bali is deff on my bucket list! !